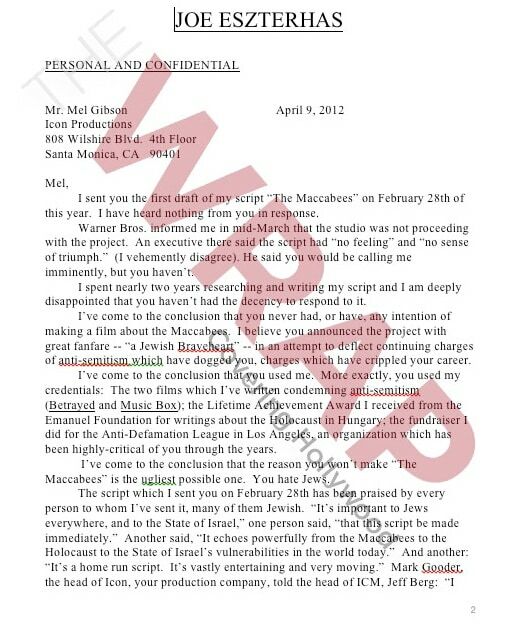 Mel Gibson has fired a return volley toward Joe Eszterhas in the jousting over why Warner Bros. rejected the screenwriter's screenplay for a proposed movie about Jewish warrior Judah Maccabee. The studio said Wednesday that it was not proceeding with Eszterhas' script and was "analyzing what to do with the project." The news prompted the "Basic Instinct" writer to allege in a letter posted by the Wrap that Gibson, who was to produce and possibly direct the film, never wanted to make it because, as Eszterhas said of Gibson, "You hate Jews." The actor and filmmaker, in response, sent Eszterhas a letter of his own, also sent to The Times, alleging that Eszterhas' script was "substandard" and "a waste of time." I have your letter. I am not going to respond to it line by line, but I will say that the great majority of the facts as well as the statements and actions attributed to me in your letter are utter fabrications. I would have thought that a man of principle, as you purport to be, would have withdrawn from the project regardless of the money if you truly believed me to be the person you describe in your letter. I guess you only had a problem with me after Warner Brothers rejected your script. I will acknowledge like most creative people I am passionate and intense. I was very frustrated that when you arrived at my home at the expense of both Warner Brothers and myself you hadn’t written a single word of a script or even an outline after 15 months of research, meetings, discussions and the outpouring of my heartfelt vision for this story. I did react more strongly than I should have. I promptly sent you a written apology, the colorful words of which you apparently now find offensive. Let me now clearly apologize to you and your family in the simplest of terms. Contrary to your assertion that I was only developing Maccabees to burnish my tarnished reputation, I have been working on this project for over 10 years and it was publicly announced 8 years ago. I absolutely want to make this movie; it’s just that neither Warner Brothers nor I want to make this movie based on your script. Honestly, Joe, not only was the script delivered later than you promised, both Warner Brothers and I were extraordinarily disappointed with the draft. In 25 years of script development I have never seen a more substandard first draft or a more significant waste of time. The decision not to proceed with you was based on the quality of your script, not on any other factor. I think that we can agree that this should be our last communication. Photo: Mel Gibson. Credit: Kirk McKoy / Los Angeles Times.